Every fighter hates losing. But featherweight prospect Shane Burgos REALLY hates it. So much so that when he suffered a takedown to Charles Rosa in their 2017 Fight of the Night battle, he nearly considered it a defeat, even though he won the fight. 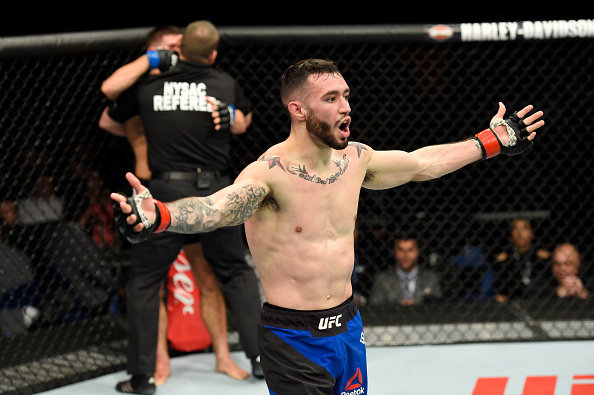 So imagine how the Monroe, New York product felt after his first MMA loss to Calvin Kattar in January. Again, it was a Fight of the Night award winner, only this time it was Burgos on the short end, as he was stopped in the third round by the New Englander. And no, he didn’t accept it as just one of those things. It happens. To everybody. And Burgos wasn’t fooling himself into thinking he was going to run over the featherweight division for the next ten years without running into someone who had his number on a particular night, but he didn’t see the Kattar loss coming. That’s the past, and if there is any consolation for Burgos, it is that Fight of the Night bonus and knowing that his stock didn’t drop in defeat. Of course, that’s the view from the outside. That work begins on Saturday night in Madison Square Garden when Burgos faces Kurt Holobaugh at UFC 230. It’s the kind of matchup that could put another bonus check in the New Yorker’s pocket, and that works for him. Add in the fact that he’s got his Tiger Schulmann Fight Team squadmates Lyman Good and Julio Arce fighting on the same card, and there’s plenty of motivation to get things done for himself and the team. For Burgos, there’s only one statement he can make and that’s getting a win. There is no other option as far as he’s concerned.